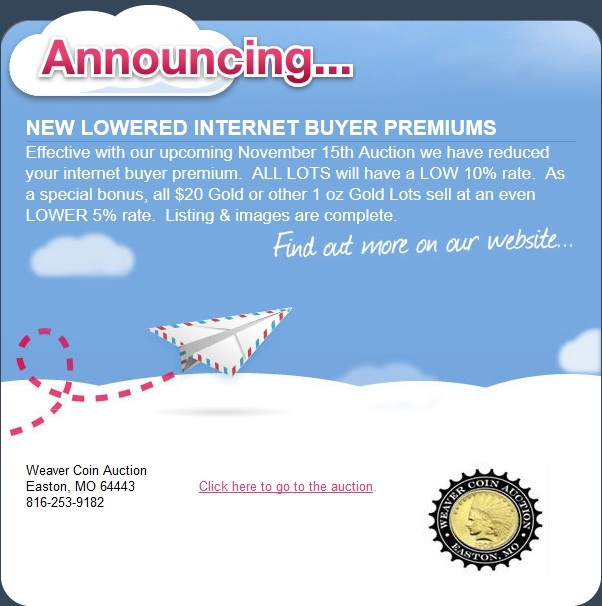 Dave and Cheryl Weaver continue to raise the bar on Proxibid coin auctions, understanding how to spark competition among onsite and online bidders and unafraid to innovate–a strategy that brings them top consignments, more business and satisfied customers … including Proxiblog. Up until six months ago Western Auction had the lowest online coin buyer’s fees on Proxibid at 5%. Western raised its fees to 10% but still remains one of our favorite Proxibid auctions, known for quality consignments, sharp photography, inexpensive shipping … and happy returning customers. Weaver’s Coin and Currency at the time was charging 17% buyer’s fees with good photography and great customer service, including knowledge about numismatics. They updated photography to one of the best on the portal and lowered buyer’s fees to 14% (rare coins), 10% (small gold) and 5% (large gold). Moreover, the Weavers mastered online advertising basics, featured in this post. Now, in this new advertisement–as concise as any professional agency’s–the Weavers will match Western’s 10% with 5% on gold. Their next auction is scheduled Nov. 15, and we’re spreading the word to local coin clubs and bidding friends to compete for yet another great consignment featuring ancient coins, US and World rarities and lots of gold. Hats off to the Weavers for continuing the great competitive tradition of auctioneering! This entry was posted in Best Practices, Featured Updates, News and tagged American Numismatic Association, Auctioneers, AuctionZip, Best Practices, Cheryl Weaver, Coin Auction, iCollector, National Auctioneer Association, Proxibid, Proxiblog, Western Auction. Bookmark the permalink.